How are you? Enjoying your last days of summer vacation, or you are one of the (un)lucky ones who are done with school and college and all that stuff? Anyway, in case you miss anything, there will be my recaps to give you a glimpse of all the main events, or just remind you of what happened. And one starts right now. On Monday, we got new store - '9 to 5'. The idea is nice. We also got posed stuff which was neither limited, expensive or superstar only. (Why that can't be with all posed stuff?) Anyway, title '9 to 5' suggests a regular job, not one of those shown in store. Anyway, I am loving the store and the idea behind it, I love outfits and flowers are really nice, and I hope we get some other nice outfits soon. On Tuesday, Stardoll announced 75% off closing sale on 2 interior stores. The stores on sale were Evening Falls and Wild West. This time, seems like Stardoll didn't want to bother offering us 1st 60% off sale, and on the last day, lowering prices to 75% off. Personally, I don't like when interior store goes on closing sale, as maybe I don't need some item(s) at the moment, but may need them later. Anyway, there were some really nice items on sale and I hope you got what you wanted, or may want in a future. On Wednesday, Stardoll released new floor of Splendid jewelry store. There are some really nice, interesting and unique items. The collection is overall great. I especially love lips and eye make up - much easier to use than 'regular' one. The pink rose is a cute addition, as those pretty headbands, which you may try using as necklaces - I don't know, I haven't tried it. On Friday, we got new Fallen Angel collection. The items are typical. for this store - dark, unusual, but still pretty and unique. It is a small but okay collection. Items can be combined great with items from other stores, creating many unique and interesting outfits. Ok, I love almost everything except that creepy tee with a bug on it - who likes bugs anyway? 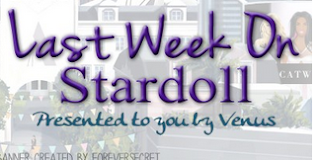 The same day, Stardoll announced September Hot Buys. At first glance, collection seems nice. And true, there are some nice items. But not all. The blue collared blouse is my favorite, and I love few other items too. Weird thing on this pic is that we don't have dolls wearing outfits, just mannequins, and all with both straight legs, unlike in our suites. Yeah, that sums up the week. Hope you got what you wanted, and I believe MSW is coming soon, so prepare your stardollars if you plan to try placing in semi finals. So, as usual, vote, comment, and see you next week.